Welcome to Day 9 of TLC for your gut and getting your grocery lists and food shopping in order! Sign up for the email if you want to receive a happy-gut tip every day for the next three weeks. Immediately improve your gut health, and make it easy to love your belly, so that your belly loves you! Grocery lists are a huge time saver. Whether that is a list on your phone, or using the list in It Takes Guts to Be Happy! find a system that works for you. Writing items on random bits of paper is not one of them—I know this from experience! No one wants to get home from the store–starving and ready to cook, and discover you forgot a key ingredient? This is especially true throughout the 21-Day Cleanse, and eating clean; you will want to have exactly what you need at your fingertips. Before you leave the house, look at recipes and take note of all missing ingredients. It Takes Guts to Be Happy! provides an abundance of gut-sensitive recipes. Peruse your pantry and double check your refrigerator. Think about what you will eat for lunch daily for a week. Next, think about people for whom you are cooking and shopping for. You can make someone’s day keep their favorite non-dairy ice cream or gluten-free treat in the house. I like to buy organic fruits and vegetables fresh from the store near my house. If you are organized it is easy to prepare and eat fresh food. Remember the saying, “Don’t shop hungry?” This is true to some degree; yet, sometimes, being hungry—or enduring hungry kids while shopping—might inspire us beyond routine recipes to experiment with something new. Anyone can get in a rut with food. Be brave when grocery shopping. Happy-Gut Reminder: Take a few extra minutes to organize. 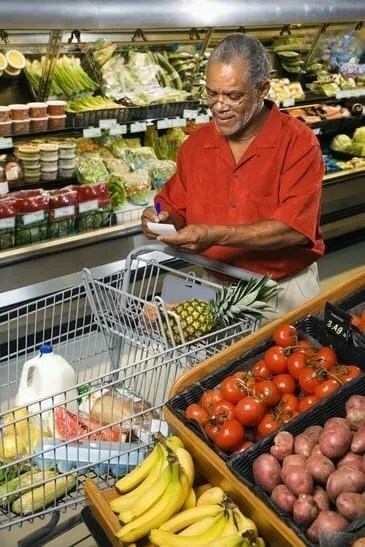 A grocery trip without a grocery list may be a trip you will need to make twice!